Summary from Goodreads: Sookie Stackhouse finds it easy to turn down the request of former barmaid Arlene when she wants her job back at Merlotte’s. After all, Arlene tried to have Sookie killed. But her relationship with Eric Northman is not so clearcut. He and his vampires are keeping their distance…and a cold silence. And when Sookie learns the reason why, she is devastated. 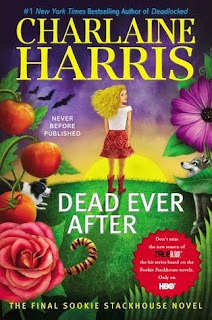 The Review: It's the final Sookie book in a series that I've been addicted to since the beginning. Yes, it's sad that it's the last one, but I found it just as hard to get through as the last couple of installments. Why? I was bored. I don't care what Sookie cooks, or eats, or thinks about cooking. I want the action and love and suspense that made me read the first eight books over and over. I do think that things wrapped up nice enough for my satisfaction, but the whole time I felt disappointed with the lack of UMPH behind the writing. I don't have an issue with the Eric situation - he is who he is and I think his actions stayed true to his survivor mentality. I'm not sure how I feel about how Sookie's love-life ended up...in some ways it makes sense, in others...it seemed forced. But, I still paid a ridiculous amount of money to read this on my kindle, and in all - I'm not too disappointed. The Good: I do think it was a worthy ending. Left room for some follow up should Charlaine choose to do it, but I enjoyed seeing some of the old characters come back. The Issue: The writing. I don't know if it's because of all the other authors I've read (mainly indies!) since my addiction to Charlaine, but the quality of writing just wasn't what I've come to expect. Even the blurb irks me. The Rating: 3 conch. A meh end to an awesome series and characters that will stick with me forever.